1. Crude oil rising: Oil futures are trading higher on Monday as OPEC members attempt to build consensus for a production cut ahead of a meeting in Nov. 30 in Vienna. The price of crude jumped 1.4% to just under $47 per barrel after Iraq's oil minister made positive comments over the weekend. His Iranian counterpart also suggested a deal is likely. There are, however, potential stumbling blocks that could still derail a deal. The cartel has repeatedly failed in recent months to freeze or cut production despite assurances that it would. 2. Social buyback: Facebook (FB) has approved a plan to buy back as much as $6 billion of its stock starting in the first quarter of 2017, it said in a filing with the Securities and Exchange Commission on Friday. Stock buybacks are typically embraced by more mature businesses experiencing slowing growth. They can make a company's earnings look better by reducing the total number of outstanding shares. Shares in the social media network were flat ahead of the open. 3. Trump's team: Billionaire investor Wilbur Ross has emerged as a leading contender to be President-elect Donald Trump's commerce secretary. The renowned distressed debt investor met with Trump Sunday at his New Jersey golf course. The commerce secretary, a cabinet-level position that requires Senate confirmation, typically serves as the government's chief business advocate. Trump is also evaluating candidates to lead the Treasury Department. 4. Global market overview: Investors have a green light on Monday. Most markets in Asia closed in positive territory, led by Japan's Nikkei and the Shanghai Composite. Both indexes advanced by nearly 0.8%. European markets are also higher in early trading, but with gains in the neighborhood of 0.2%. 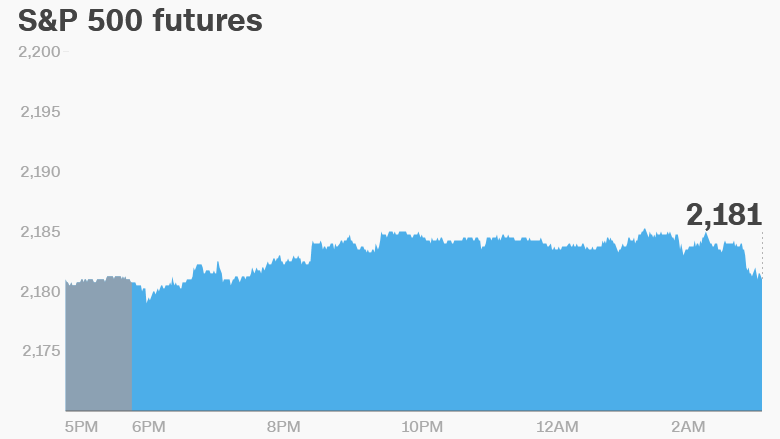 U.S. stock futures are pointing to a positive open. The Dow Jones industrial average, S&P 500 and the Nasdaq all shed roughly 0.2% on Friday. 5. Earnings and economics: Tyson Foods will report its quarterly earnings before the opening bell. Jack In The Box (JACK) and Palo Alto Networks (PANW) will report after the closing bell. Chinese tech firms SINA (SINA) and Weibo (WB) will also update investors on their performance. There are no major economic reports for publication Monday.